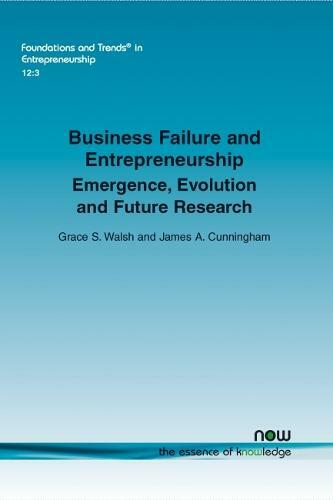 This book explores the issues and provides a comprehensive overview of the evolution of business failure research that has surrounded the subject over the years within the entrepreneurship literature. This literature review is organized as follows:Section 2 discusses the lack of a universally accepted definition of business failure, the difficulties that arise from this, and the way in which this has directly contributed to the limitations of quantitative studies. Furthermore the range of definitions employed by various studies within the literature is examined in addition to the diverse methodological approaches.Section 3 charts the emergence of failure studies in the business literature, from their roots in financially driven bankruptcy prediction models to the more encompassing organizational decline models. The review also explores competing perspectives of business failure - deterministic and voluntaristic. These two distinct schools of thought raise compelling, albeit reductionist arguments in their exploration of the drivers of business failure.Section 4 provides a review of the extant literature on business failure in the entrepreneurship field. The focus is on the areas of enquiry that have dominated literature in the area. The section examines the body of knowledge on causes of, learning from, and psychological effect of failure in the context of entrepreneurship. Additionally the literature pertaining to emotions and failure as well as recovery from failure are discussed and popular theories that accompany these subjects are considered. This section culminates in an overview of the methodological approaches that are more commonly seen in the recent literature and then discusses the way in which these approaches compare to previous research methods.The latter part of the review is comprised of Section 5 where an overview of the limitations of current approaches to the study of business failure is presented; particular focus is given to the issues that arise from retrospective biases.Finally, Section 6 explores the future of the research topic within the entrepreneurship literature.The review concludes with a summary of the key arguments presented and an iteration of the importance, for both theory and practice, of sustaining and advancing business failure research.